I’ve installed the update this morning and I’m glad to say that – after launching the app once, closing it out and going back in – I am definitely noticing the quicker load times. I’m also glad to see that the app’s developers are continuing in 2011 where they left off last year, with frequent and useful updates (over a dozen in 2010). You can find the latest version of Weather HD in the App Store now, priced at $0.99. 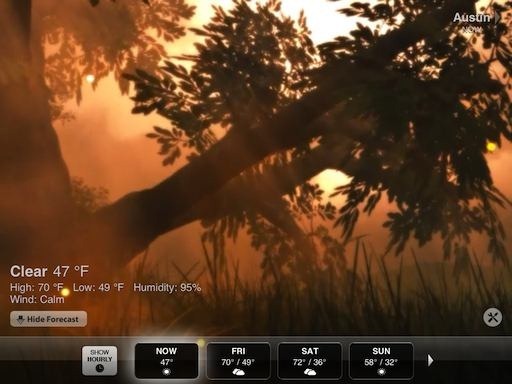 Weather HD – my favorite gorgeous weather app for the iPad – has been updated, to Version 1.5.3, also known as Weather HD: Christmas Edition. 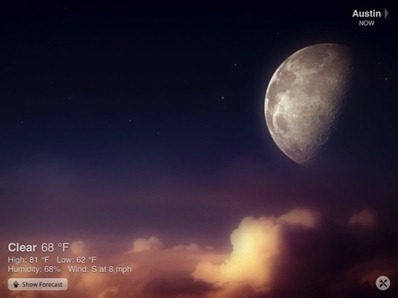 The update – as its name might suggest – has added some Christmas-y, wintery imagery to the app’s beautiful interface. These new images almost make me feel a little cold – but then I glance down and make sure Austin will still get into the 70s today and I know all is right with the weather. Weather HD – the most visually striking iPad weather app – has had yet another update, to Version 1.3. The two big new features in this version are: a digital clock element that you can add to its display and a Night Mode that dims the display if you tap twice anywhere on the screen. 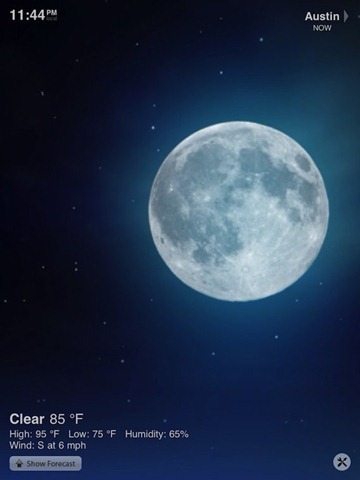 You can also choose what size to display the clock at, or to not display it at all if you like. In addition, five new videos have been added and some (un-named) bugs squashed. Another small but useful update for an already stellar app. 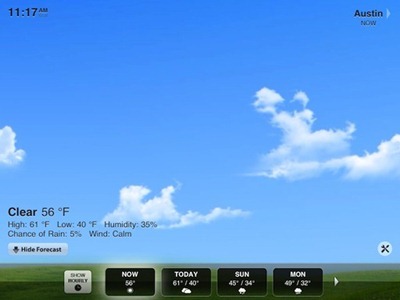 You can see my recent review of it here: http://ipadinsight.com/ipad-app-reviews/ipad-weather-apps-weather-hd/. This latest version of Weather HD is available now in the App Store, priced at $0.99. > 7-Day forecast, up from 4. 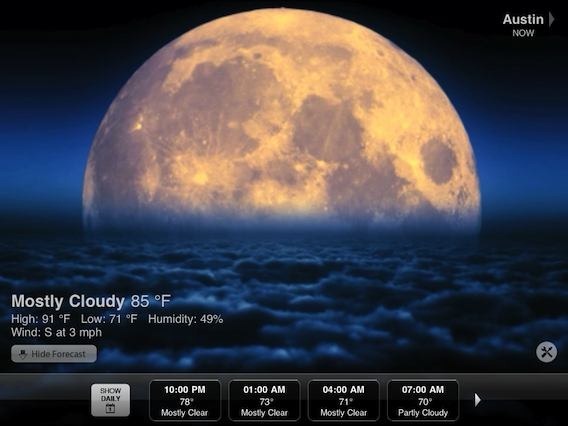 ➤ 3-Hourly forecast for the next 24 hours. ➤ Several bug fixes and improvements. The first two are small enhancements, but welcome ones – providing more forecast details and options. Weather HD is easily the most gorgeous weather app I’ve ever seen, and one of the most beautiful apps of any kind I’ve come across. 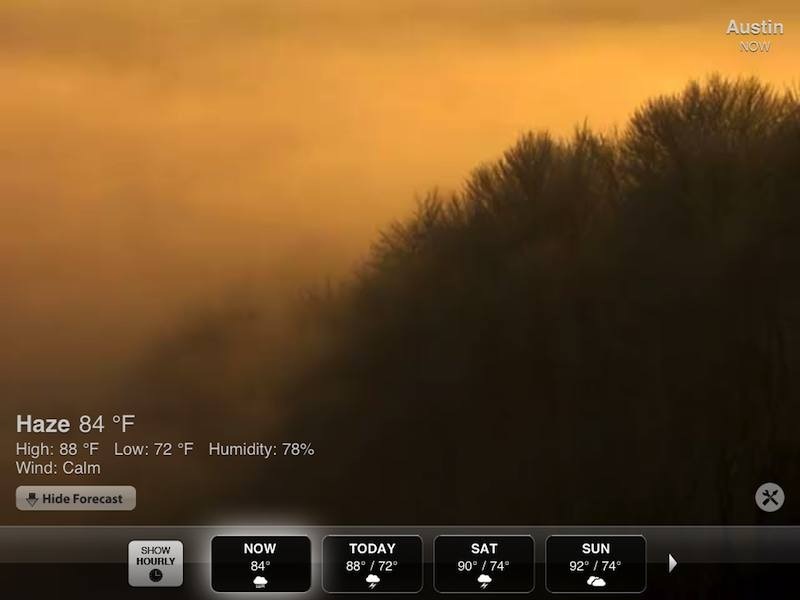 It currently offers a slim amount of weather information but presents it beautifully using high-definition videos.